Website Questionnaire: The website design processes begins with the Client completing a Website Questionnaire. This will allow us to learn more about the organization’s goals, website content needs, and features required as well as aesthetic style requested. Planning Meeting: After the questionnaire is completed and returned, we will schedule an online GoToMeeting with all primary parties that need to be involved during the project to make sure everyone knows their role with regard to the website process and what is expected of them, and a general plan will be determined. Website Design: From the information gathered in both the questionnaire and the Planning Meeting, our designer will usually create three different designs of the home page. Of these options, the Client will decide which direction is the strongest, and revisions will be made to this design to ensure it is exactly what the Client is looking for. The header (area at the top of a webpage that usually includes a logo and navigation menu) and footer (area at the bottom of a page containing contact and copyright information) of this design will be used to frame the content of all the other internal webpages. Project Manager: We ask that the Client designate one person who acts as the intermediary between our designer and any interested parties of the Client. All designs will be sent to the Design Contact to gather feedback and push for consensus internally. Revisions and suggestions will be automatically entered into our ticket system by simply replying to design emails. We provide a level of personalized customer support that is hard to beat. As experienced professionals of Vieth Consulting, we pride ourselves on the high-quality support we provide each and every one of our valued clients. Our competent team will personally guide you step-by-step through the development of your new software and website. We offer personalized training sessions that are recorded and then stored in your file archive to reference later and for new system admins to review. We are here to carefully listen and quickly respond to your organization's unique needs. We offer a 24/7 email-based online ticket system, phone support during regular business hours, and a comprehensive online Help Desk feature built into every system. But, don't take our word for it - read what some of our clients have to say about our excellent service. Vieth Consulting specializes in website solutions for associations. 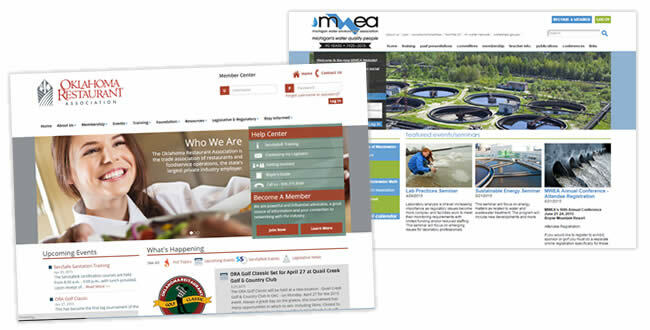 We work with you to make sure that your website is not only a great promotional asset, but a powerful organization and communication tool. During the design phase of your website, you will work directly with one of our design experts. They will gather your association information, schedule a planning meeting, provide you with a series of ideas and renderings, and work with you until you approve the final design. *All of the custom websites created by Vieth Consulting come with a 100% money-back guarantee on the design. If the custom website design doesn't meet the clients satisfaction, we will refund their money. 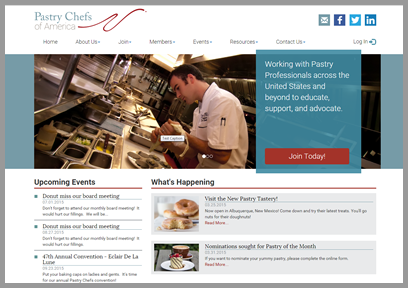 To illustrate the internal (back office) features of our association websites that are provided by MemberLeap, we have created a fictional association - the Pastry Chefs of America. Different organizations have different needs. Here are a few of the various types of organizations which can benefit from our services.